The latest quarterly sales data from Nielsen shows that while just 25.1 percent of American smartphone buyers in October chose an iPhone, that number ballooned to 44.5 percent in December. In addition, 57 percent of new iPhone owners polled in December indicated they bought an iPhone 4S. Though Apple's massive spike in sales helped the company close the gap on Android, Google's mobile platform remains the most popular choice among smartphone owners in the U.S. Nielsen found that 46.3 percent of all domestic smartphone owners have an Android device, compared to the 30 percent share iOS holds. But in October, before the iPhone 4S launched, Apple's 25.1 percent share among recent smartphone acquirers was more than 35 percentage points below Android. In November, the gap was narrowed considerably to less than 10 points, and by December, the iPhone had come within 2.5 point of Android. Apple finished the year with a 44.5 percent share among recent smartphone buyers, nipping at the heels of Android and its 46.9 percent share. 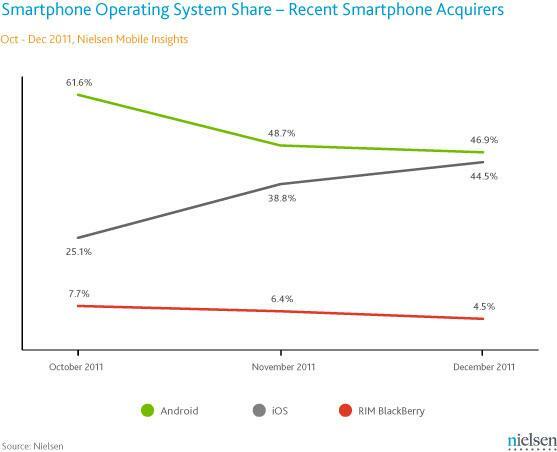 RIM's BlackBerry platform continued a downward slide through the end of 2011, dropping from a 7.7 percent share among recent smartphone buyers in October, to just 4.5 percent in December. 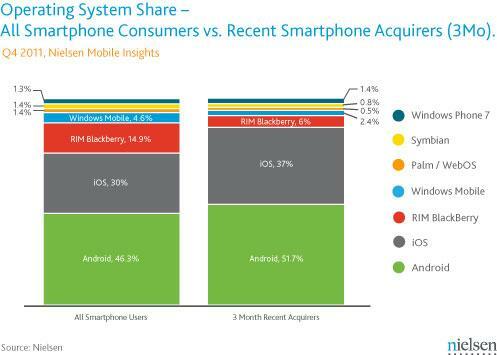 Microsoft's Windows Phone 7 and Windows Mobile, Nokia's Symbian, and HP's Palm webOS combined for just over 5 percent of recent purchases. Nielsen also found that as of the fourth quarter of calendar 2011, 46 percent of U.S. mobile consumers had smartphones. The number is growing quickly, and 60 percent of those who bought a new handset in the last three months chose a smartphone. Apple's tremendous performance in December is a major turnaround from what Nielsen found last September, when the iPhone represented 28 percent of recent smartphone sales in the U.S. At the time, Android was continuing to grow and held a 43 percent share. At the time, Nielsen cautioned that Apple's market share could "change quickly" with the launch of a new product. Only weeks later, the company introduced the iPhone 4S.